Please rotate your device. This site is best viewed in landscape mode. 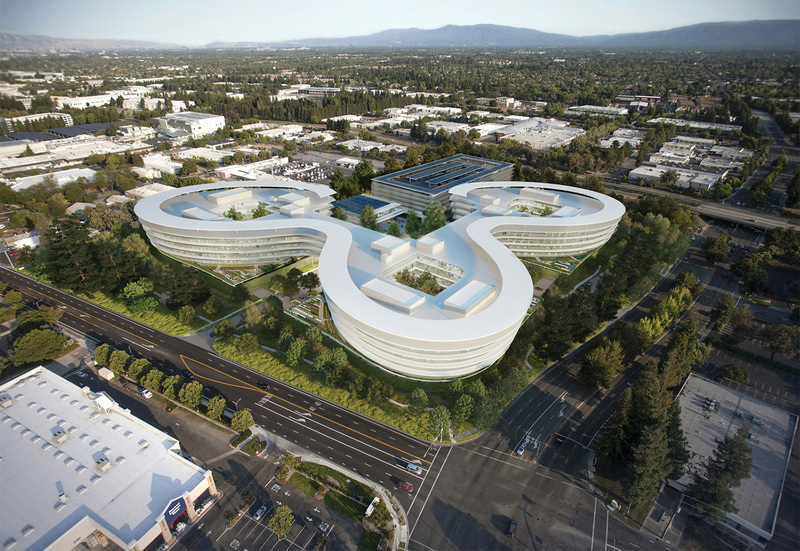 Can a Free Market Multi-Story Spec Office Building Be Energy Positive? 100% of employee parking is located in safe, secure under-building podiums and a garage. 1This is space specifically designated for chairs, benches and tables. This doesn’t include any seating in the quad or associated with the dining areas. 2This is space specifically designated for group seating and located on the podium edges, green roof or the interior courtyards. This doesn’t include any seating in the quad or associated with the dining areas. 100% of employees are within a 2 ½ minute walk (or less) from the center of the quad. 100% of employees are within 45 feet (or less) from a window. 100% of employees are within 45 feet (or less) from views of nature. 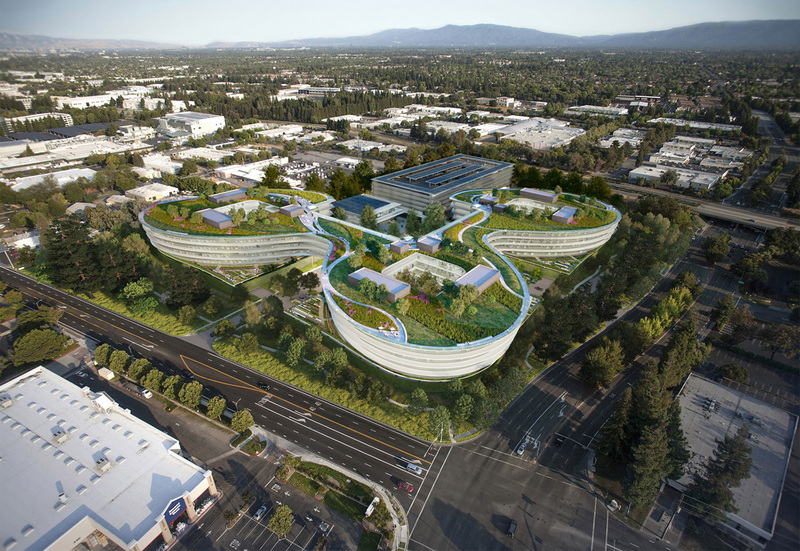 100% of employees are never more than two floors from outdoor open space and nature. Caltrain stations: Downtown Sunnyvale (1.4 mi), Lawrence (1.6 mi), Downtown Mountain View (3.9 mi). Optional dedicated shuttle service available. 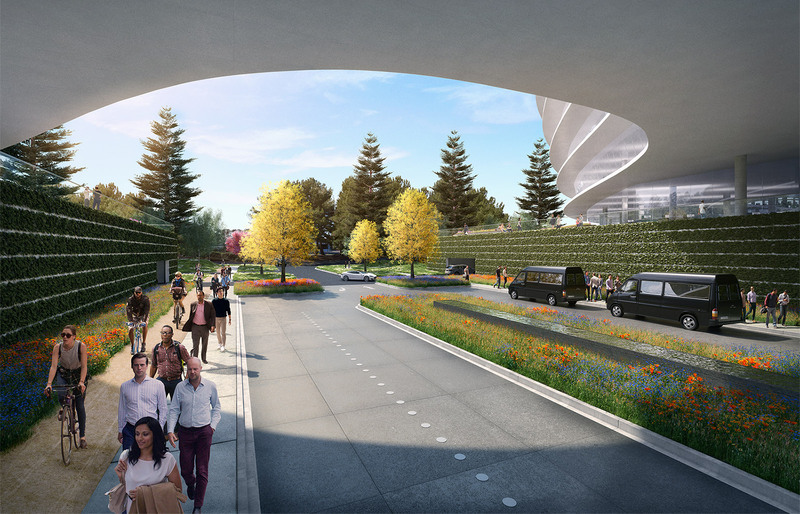 Multiple shuttle/bus pick-up and drop-off plazas. 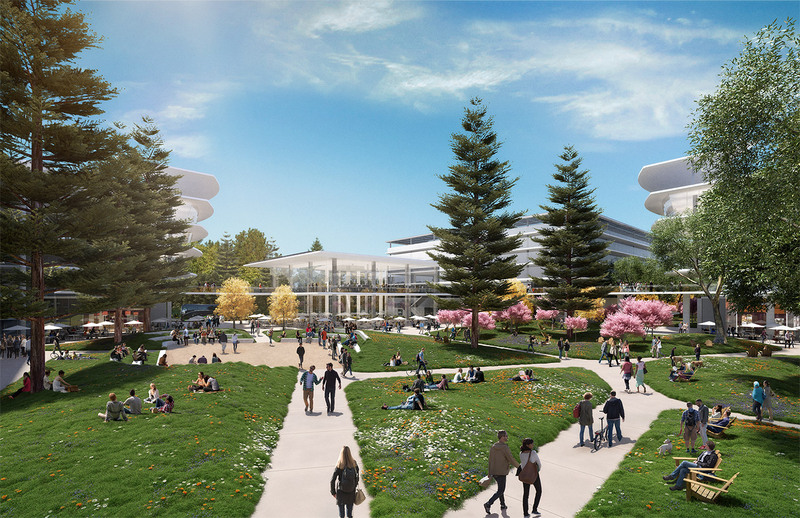 Landbank is redeveloping an 18-acre site at the intersection of Central Expressway and Wolfe Road in Sunnyvale into a creative and innovative campus for Silicon Valley’s leading edge technology companies. 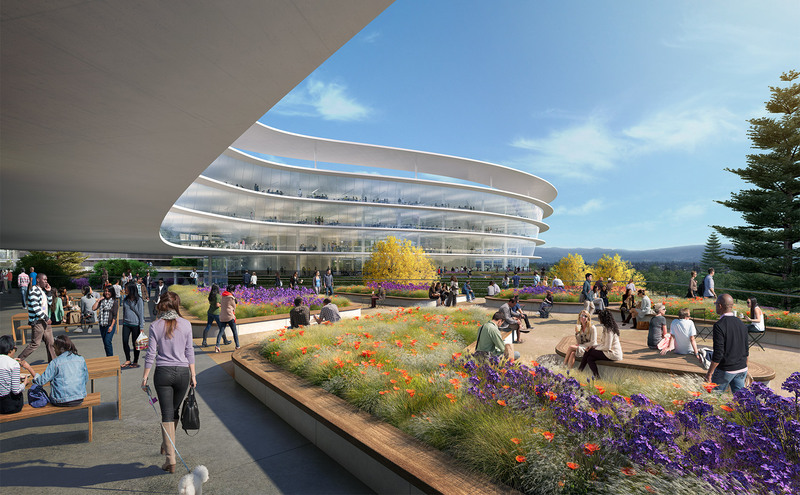 Together with our world-class design team led by HOK Architects, we’ve reimagined what a technology campus can be. 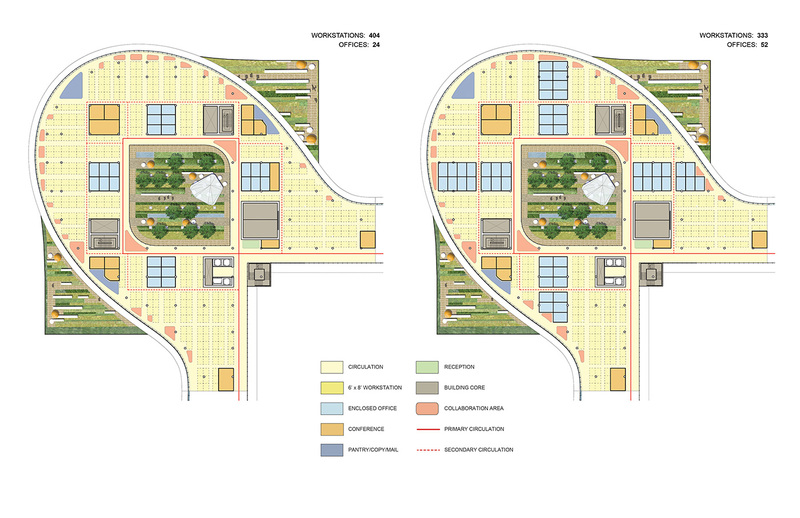 Our philosophy is simple: design a campus that will deliver an exciting, enhanced and enjoyable user experience. 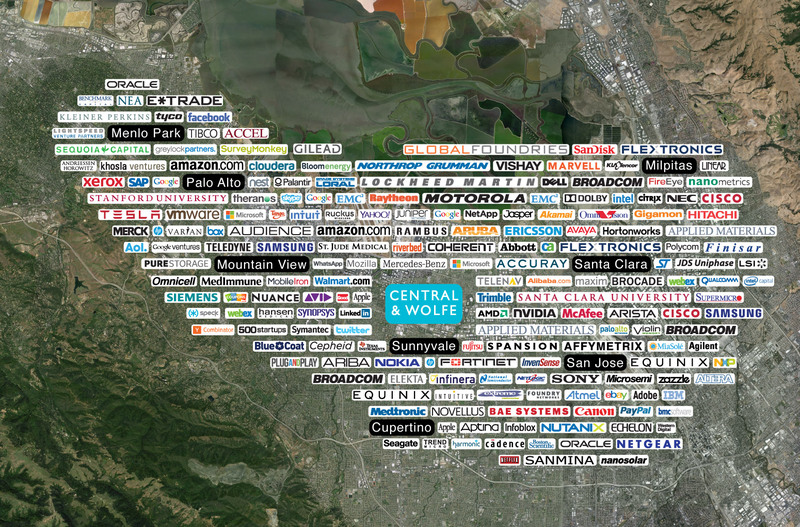 In this case, the “users” include: companies, their employees, surrounding communities, and Mother Nature. The majority of water consumed on-site will be reclaimed water. At least 18% of the electricity consumed will be generated on-site. We’re able to pursue Living Building Challenge Net-Zero Energy standards on the amenities building. 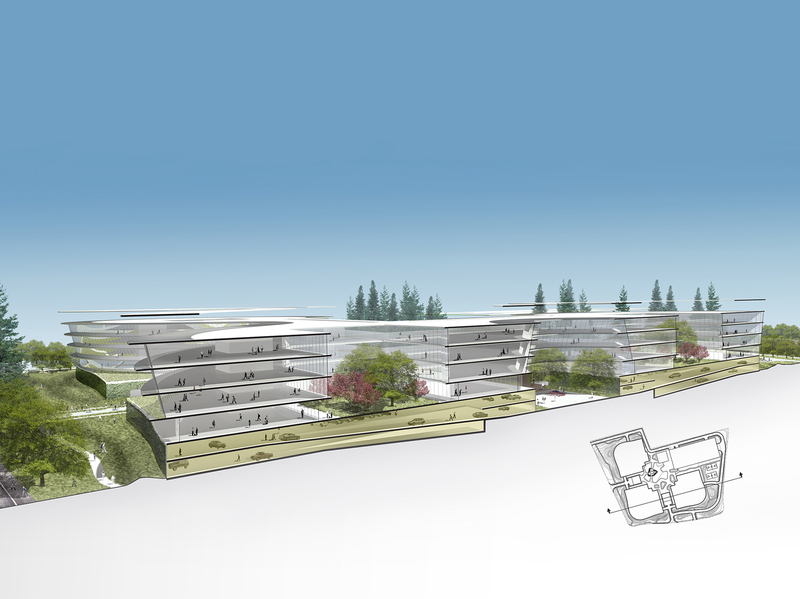 And, we’ve designed the campus to be Future Ready, with an eye towards a Net-Zero Energy, or even a regenerative future. Goodbye surface parking. Hello open space. We’ve essentially eliminated surface parking through the use of under-building podium parking and a standalone garage. 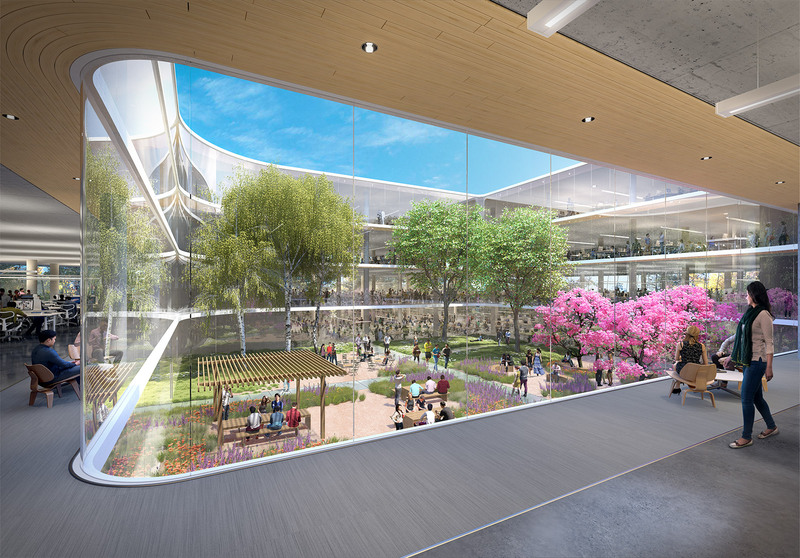 By eliminating surface parking, we’re able to preserve 53% of the 18-acre site area as open space while including over 90,000 sf of rooftop gardens. Think of this as Open Space2. 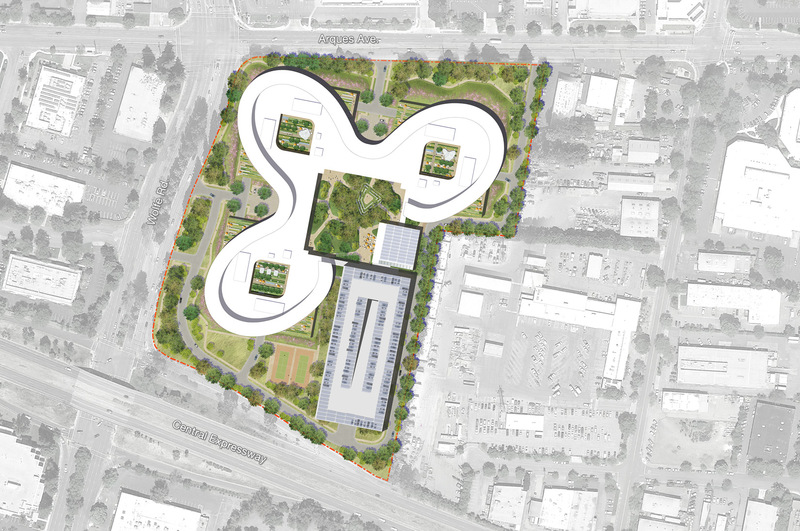 Here’s an amazing way to further increase the amount of on-site open space: an optional 208,000 sf rooftop garden with almost one additional mile of walking trails. We call this Open Space3. The campus is composed of three four-story connected office buildings and a two-story standalone amenities building. Total building square footage is 770,000 sf, of which 740,000 sf is office and 30,000 sf is services and amenities. The campus is highly flexible and divisible, and can be leased to one, two or three tenants as 250,000 sf, 530,000 sf, or 770,000 sf. There are four floors of occupied space sitting above two levels of podium parking, with the lobbies and amenities located at the ground level. And because these are post-tensioned, cast-in-place concrete buildings, all of the office spaces will have soaring 13½ foot floor-to-floor heights. Each of the three office buildings has an average floor plate of 62,000 sf, but because all three buildings are connected by 60-foot wide occupied spaces, what you really have is up to 208,000 sf floor plates. Why are large floor plates so important? Leading edge technology companies understand that collaboration and interaction are key to innovation. Placing more employees on one highly walkable floor plate helps to remove psychological barriers to collaboration and interaction. However, separating people by floors and buildings causes collaboration and interaction to drop off precipitously. The Central & Wolfe Campus’ large floor plates are more space efficient than the smaller floor plates found in most new Class-A projects. This greater efficiency is due in part to the fact that larger floor plates require less core space (i.e. stairs, bathrooms, elevators, etc.) than smaller floor plates do. Therefore, the Central & Wolfe Campus’ large floor plates yield more usable square footage (as a percentage of each floor plate) than the much smaller floor plates found in most new projects. This means that you can place more employees per 1,000 sf of space at the Central & Wolfe Campus than you can at most other new projects. Comparing the space efficiency of the Central & Wolfe Campus to other new projects is critical because it reveals that many other new projects are actually more expensive on an “asking rent per employee” basis, despite their lower asking rents per square foot. This is the ground level of the campus. Red spaces denote indoor amenities for potential uses such as: a cafeteria, fitness center, conference center, coffee bar, grab-and-go meals, general store, barbershop, bike repair shop, banking, dry cleaning and laundry pickup, health and wellness options, you name it. The central Quad has a 500-person sunken amphitheater and it’s designed to allow food truck access in and around it. 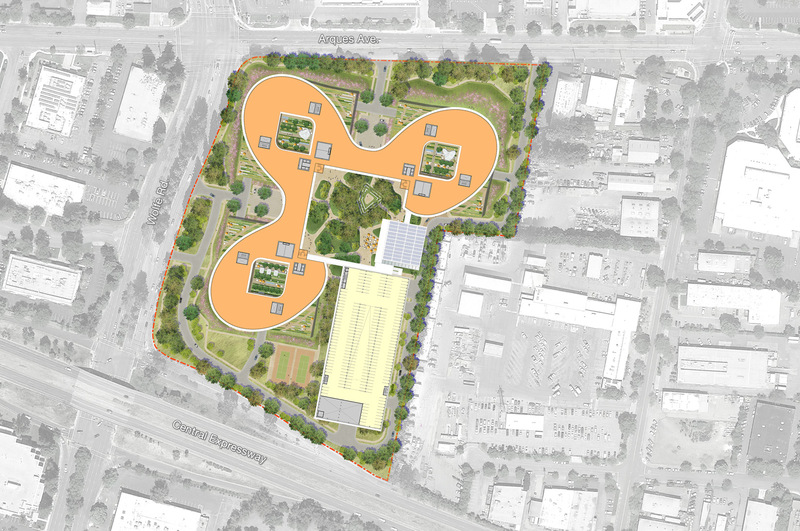 Additionally, the campus includes sports courts and fields, as well as over two miles of on-site walking and bike paths. 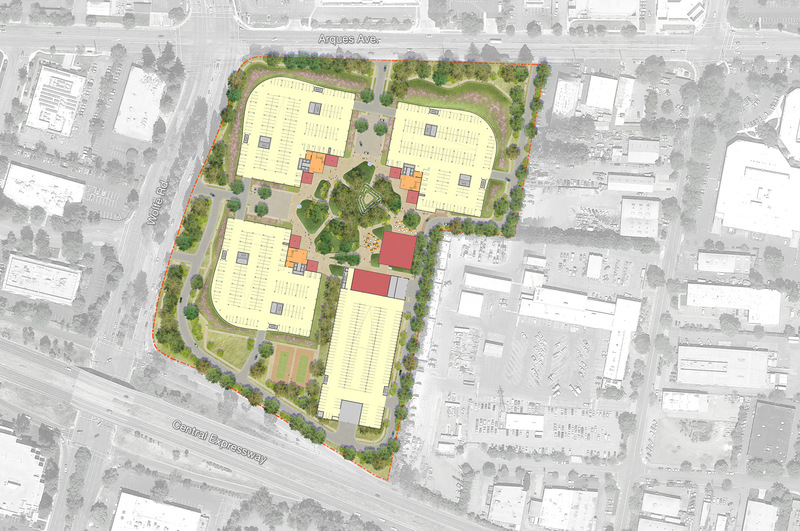 This transit-served site is located just 1.4 miles from both Downtown Sunnyvale and two Caltrain stations. 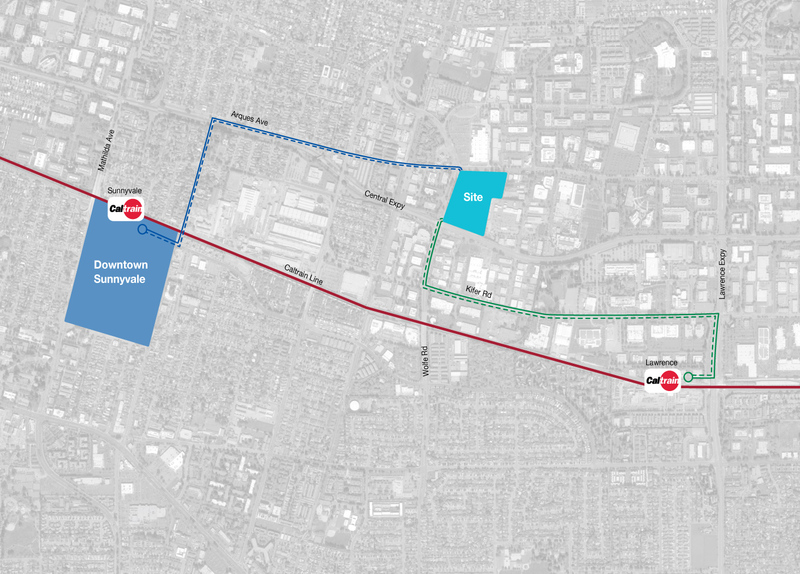 Dedicated shuttle service can connect this campus to Downtown Sunnyvale and Caltrain. When you bring all of these superior design elements together, what you get is the only large developer-driven project that will genuinely help leading edge technology companies attract and retain top talent by delivering a truly exciting, enhanced and enjoyable user experience.